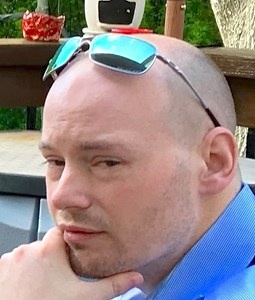 Michael “Mike” Lee Haun, 37, of Olathe, KS. Passed away Tuesday, August 2, 2016 in Kansas City, MO. He suffered from a very rare terminal disease called Multiple System Atrophy in addition to other complications stemming from Diabetes. He was born on April 2, 1979 to Jerry and Viola (Wheatley) Haun in Kansas City, MO. Mike is survived by his loving wife Andrea Lynn (Mulhall) Haun; their two children, Michael “Max” 9 and Alexandrea “Alex” 7; his sister Stephanie “Stacy” Prestage of Spring Hill, KS. Mike is preceded in death by his brother Gary Prestage. Mike graduated from high school in 1998 from Olathe East where he met and later married his High School Sweetheart on June 30, 2001 in Olathe at Prince of Peace Catholic Church. Mike went on to DeVry University and ended his very successful but short career as an IT Director. In 2007 Mike created a remote control robot designed to help search for people or hostages in a standoff situation and thus protecting lives of police officers. After completion he donated it to the Kansas City, MO. Police Department and received a Certificate of Appreciation. Mike was also involved in many hobbies which included High Tech Drones, 3D printing, long range precision shooting, Exotic Car Club, RC airplanes to mention a few. SERVICES: A “Celebration of Life” will be held on Tuesday, Aug. 9. A Visitation/Gathering from 9:30 until 11:30AM and memorial from 11:30 till 12:30 Located at the Prince of Peace Catholic Church @ 16000 W 143rd St. Olathe, KS. 66062. Officiating the ceremony, will be Father Andrew and Chaplin Paul Garrison of Kansas City Hospice. All of Mike’s family wish to extend their sincere thanks to Dr. Ponnuru for everything he has done for Mike as well as his Spiritual advisor, Chaplin Paul Garrison. We would also like to extend a very special thanks to all the loving care he received at Kansas City Hospice Hospital and another special thanks to the generosity of Prince of Peace Catholic Church for the use of their facilities.